Towards the end of the 13th century and in the early 14th century the contrasts between the popolo minuto (middle and lower middle classes) and the popolo grasso (wealthy merchants) were accentuated. The latter had a firm grip on the power, since the Priors were chosen exclusively from representatives of the Arti maggiori, who also held the majority in the Councils of the Republic. 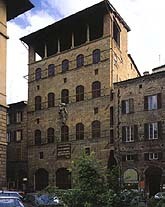 In the 14th century the popolo minuto tried several times to broaden the democratic base of the government by increasing the participation of the Arti minori in the government. In 1378, under the impulse of a movement set in motion by the proletariat led by a wool-carder, Michele de Lando, the popolo grasso were obliged to accept an institutional reform which not only extended the right to elect one of their representatives as Prior to all the guilds but also provided for the constitution of three new Guilds (Tintori, Farsettai, Dyers, Corseteers and Ciompi: the revolt was to take its name from latter) corresponding to the most humble activities and the workers.But due to internal divergent interests and an incapacity to govern, the pepole minute was unable to withstand the reaction of the large merchant middle classes which soon once more took over power. The rivalry between the Donati family which had become noble and the Cerchi family resulted in much dissension and led to the formation of two antagonistic groups of political factions to be known as Neri and Bianchi or Blacks and Whites. The former were generally exponents of the "gente nova dai subiti guadagni" (newcomers with easy profits) such as the Cerchi, who had recently come from the country and had quickly made a fortune. The Neri, under the guidance of Corso Donati grouped together the representatives of the old noble classes and the most intransigent Guelphists. The two parties took turns at the priorate in the last decade of the 13th century but from then on the conflict was intensified. The Priors were forced to exile the heads of the two factions, and the situation precipitated. The Neri invoked the intervention of the pope who sent as his peacemaker Charles of Valois, the brother of Philip Le Belle, king of France. He openly favored the Neri, and even had the heads of the Bianchi arrested and forced those who were most compromised, including Dante Alighieri, into exile. In addition to these internal struggles, the city had also to sustain the onerous burden of the wars against the powerful Ghibelline signorias of the Visconti and the Scaligeri, joined by the Pisans and the Luccans. The "foreign" policies of the merchant classes were aimed at maintaining the Guelph alliance which reunited "a military force, an economic power and a spiritual and moral power that all complemented each other perfectly" (Y. Renouard). Two serious defeats (Montecatini, August 29, 1315 and Altopascio, Sept. 23, 1325) induced Florence first to ask for the protection of the Angevin troops (accompanied by the government of a viceroy of King Robert's), then to place themselves under the direct dominion of the house of Anjou, in the person of Charles, duke of Calabria. The death of the duke in 1327 unexpectedly restored its freedom to the Florentine Commune. But it did not end there.A new attempt to take over Pisa and Lucca failed miserably. The Florentines, defeated by the Ghibelline forces under the leadership of the lord of Verona, Martino della Scala (1339), were once more forced to ask King Robert for aid. This resulted in a brief tyranny by a viceroy of the king, Gualtierio di Brienne, duke of Athens, who even succeeded in getting himself nominated lord for life. The tyranny ended on July 26, 1343, on the day of Saint Anne, and the people, tired of violence and abuses of power, threw out the tyrant and restored the civic liberties. During the 14th century, internal strife and wars were aggravated by famine and epidemics (particularly deadly the plague of 1348) which made a situation that was already precarious even more grievous. It was a period of decisive juncture common to all Western economy. Further damage was caused by the disastrous flood of 1333 which also swept away all the bridges over the Arno except the Rubaconte. The 14th century was therefore a century of political and economic crisis, apart from the fact that epidemics reduced the population by half. The crisis was also reflected in the city's architectural activity which continued at a much slower pace than before. The buildings that saw the light in the 14th century, even if on the whole greatly inferior to those of the preceding century, were nonetheless outstanding achievements and the expression of a precise cultural will on the part of a ruling class which disposed of a productive structure with a noteworthy capacity for the accumulation of capital. From the point of view of town planning the city settled into the form already established by the developments of the 13th century. Building activity turned first of all to finishing the great undertakings of the end of the 13th century (the walls, the cathedral, the Palazzo della Signoria, the large monastic complex) and to reconstructing the bridges which had been destroyed. The first of these to be rebuilt, between 1334 and 1337, was the Ponte alla Carraia, apparently after a design by Giotto. 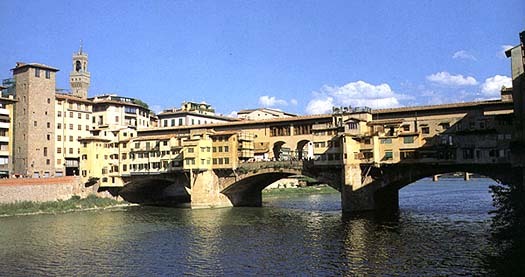 The reconstructions of the other bridges, from the Ponte Vecchio on, were based on this bridge. The Ponte Vecchio built by Taddeo Gaddi in three sweeping arches with a road much wider than before. Also the Loggia dei Lanzi and the church Orsanmichele were built at the same. After the impressive expansion of the 13th century, the city began to take shape and what might be called a real town planning policy attempted to provide the inchoate building fabric with some degree of order and regularity. Throughout the 14th century one provision after another was taken in an effort to broaden the streets or modify their routes; to tear down ramshackle buildings or those with superstructures (such as projection or external stairs) wich impeded traffic. The main scope of the Commune's town planning policy (widen and straighten the streets) was on the whole successfully accomplished in the sector that lay between the last two city walls, but was much more difficult in the older heart of the city. Public intervention, at least in most cases, was based on considerations of "decorum". "For the greater beauty of the city" new piazzas were created or renovated; it was decreed that the houses were to have a stone facing on their lower part, certain activities were prohibited because they were antihygienic; unhealthy areas were to be reclaimed. Naturally the Commune's first obligations were in the reorganization of the city's two principal piazzas (Piazza della Signoria and the area around the complex of Cathedral and Baptistery, which required the demolition of various structures) as well as the broadening of the Via de' Calzaioli to unite the two piazzas. As can often still be seen, the buildings that line this street have a facade with rough-hewn blocks of pietraforte at least in the bottom part, and a series of regular arches in correspondence to the ground floor, features that had already appeared in some of the buildings in the Piazza della Signoria and in those set behind the apse of the Duomo. Loggias and large arcades were frequently used in civil architecture of the 14th century where the ground-floor rooms served as warehouses or shops and the vaulted loggias were reserved for the official family ceremonies. The patrician building of the 14th century, the best example of which is the Palazzo Davanzati, built by the Davizzi around 1330, has by now lost all pretense of being an offensive or defensive structure. The size kept increasing, where possible, and the ground plan of the palaces expanded to include courtyards and even small green areas inside. The revetment, of rusticated pietra forte for the lower floors, became smoother on the upper part where rhythmic rows of arched windows were inserted. The typical "Florentine" arch consisted of a roundheaded or flat intrados and a slightly pointed extrados.